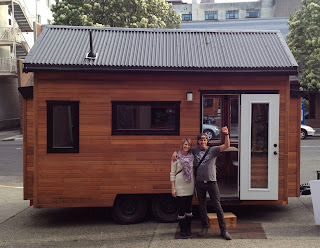 At the end of last year, I wrote a popular post titled "2014 in Review: A Pivotal Year for Tiny House Villages." 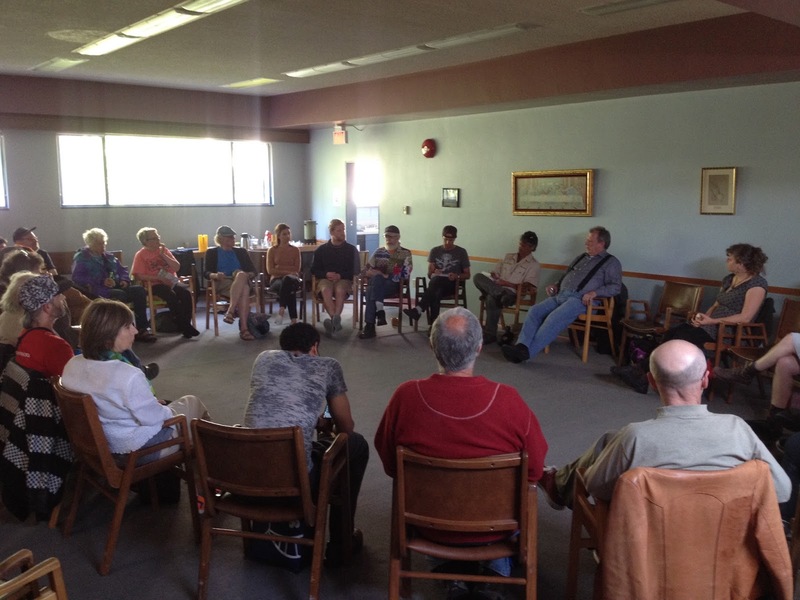 At the start of the  year, Eugene's Opportunity Village had been open just a few months, Olympia's Quixote Village just a few days, and Madison's OM Village was still just an idea. Since then, these projects have helped inspire a housing model being pursued throughout the country—a model that's beginning to seem less radical, and more practical—and a model that's therefore beginning to see substantial political support for addressing the persistent issues of homelessness and affordable housing. As 2015 draws to an end, I thought I'd provide a recap of some of what has transpired since then. Derek Joel visited Opportunity Village this past spring looking for a model to address homelessness in his hometown of Lake County, CA. The idea has since been quickly put into action for a then unknown purpose—a shelter solution for the refugees from the devastating wildfires that hit the area this summer. Follow along at Cornerstone Villages. "We are currently building tiny home villages in Lake County, CA, offering a safe and secure place to be for those who are unhoused. Due to the Valley Fire destruction, thousands have been displaced with only a portion having insurance to fund rebuilding their lost homes. Cornerstone Villages is in the process of building several tiny home villages that will give a mid to long term solution for those in need. It takes a Village to build a Village. Join us." 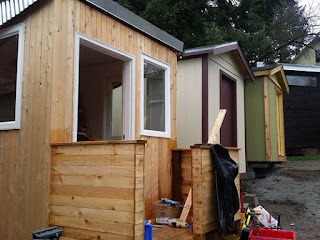 Big strides were also made in Seattle, where Nickelsville—a tent city featured in my book—is transitioning to a tiny house village that is currently taking shape thanks to some collaborative partnerships. 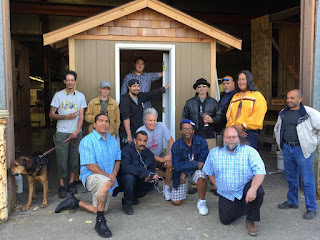 "The Low Income Housing Institute (LIHI) in partnership with Nickelsville and the Lutheran Good Shepherd is currently working on creating a Tiny House Village to support those experiencing homeless in the Seattle, Washington area. 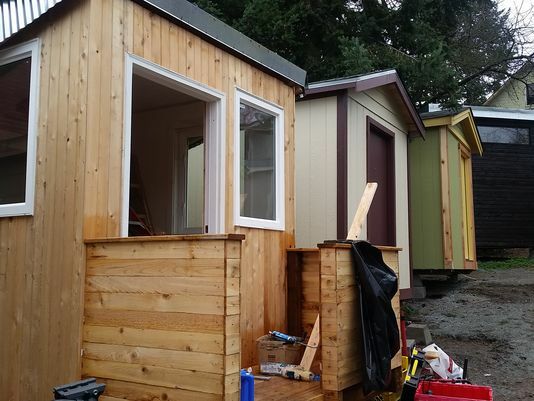 The Tiny House Village will have 15 tiny homes on the site and will contain a security hut, kitchen tent, donation hut, two toilets and a shower facility. Each of the homes is insulated and built with high quality construction. Standing at 8 feet by 12 feet, these houses provide enough space for 1-2 people. LIHI will be providing case management for the residents of the tiny houses to get them on track to moving into permanent housing. The Lutheran Church of the Good Shepherd has generously provided the land to accommodate the village, while Nickelsville will be conducting the referrals for the site and implement a self-governance structure in managing the village. The partnership among LIHI, Nickelsville, and the Lutheran Church has been crucial to the success of this village. 7 volunteer build groups are building the 15 tiny houses, including construction companies that have donated their time and effort as well as pre-apprenticeship and vocational programs that have incorporated tiny house construction into their curriculum. Each of the houses costs $2,200 to build, and a great deal of these costs has been covered by generous donors. The partnership is working to complete this Village by Christmas of 2015. 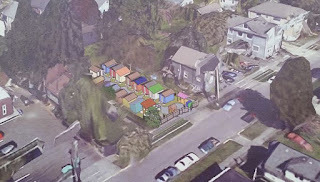 Nickelsville and LIHI have also partnered with SHARE/WHEEL to operate two tent encampments on City of Seattle property. The encampment in the Ballard neighborhood of Seattle contains 5 tiny houses along with tents on wooden platforms. These encampments on city-owned property were possible with the support of Seattle Mayor Ed Murray and the Seattle City Council. The city passed an ordinance allowing for three transitional encampments on city-owned property that will set the national standard for city government support in encampments as an immediate intervention for homelessness." 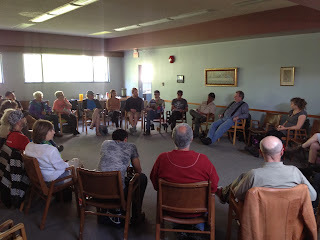 Madison, Wisconsin's OM Village celebrated their one year aniversary. It's another example that has received unanimous praise since opening, winning over many of their neighboring critics after their fears failed to manifest. "In extensive interviews with neighbors, many of whom initially fought the tiny village idea, the State Journal heard many similar comments and almost unanimous praise for the first year of the social experiment. A review of housing assessments, home sales and police calls also found no evidence so far of the dire consequences critics predicted for the neighborhood." Here in Eugene, Opportunity Village continues to operate as designed, with 17 residents transitioning to more permanent living situations this year. One stand-out highlight was a free concert held at the Village—a stop on Luc and the Lovingston's Goodness Tour—providing a well received break from the everyday grind. The video below features a lead guitar performance by one of our residents! Our next project, Emerald Village, continues to progress one step at a time. 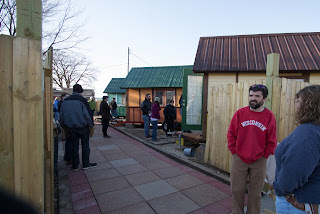 In May we purchased an acre of land for the permanent, affordable tiny house community, which will offer a step up from homelessness for some, and a more sustainable option for others at risk of becoming homeless. We've had 12 different local architect teams sign-on to design and lead the building of the first dozen houses (you can view most of those here). We also changed the name of our non-profit to SquareOne Villages in an effort to signify the expansion of our mission, both locally and beyond. Our executive director gave a TEDx talk that's definitely worth a watch if you haven't seen it yet and you've read this far! In Sonoma, California, the Board of Supervisors authorized $75,000 for county staff “to analyze six sites in Santa Rosa that could host a village — eight to 12 structures, including possibly mobile trailers, small cabins or shipping containers,” reports The Press Democrat. 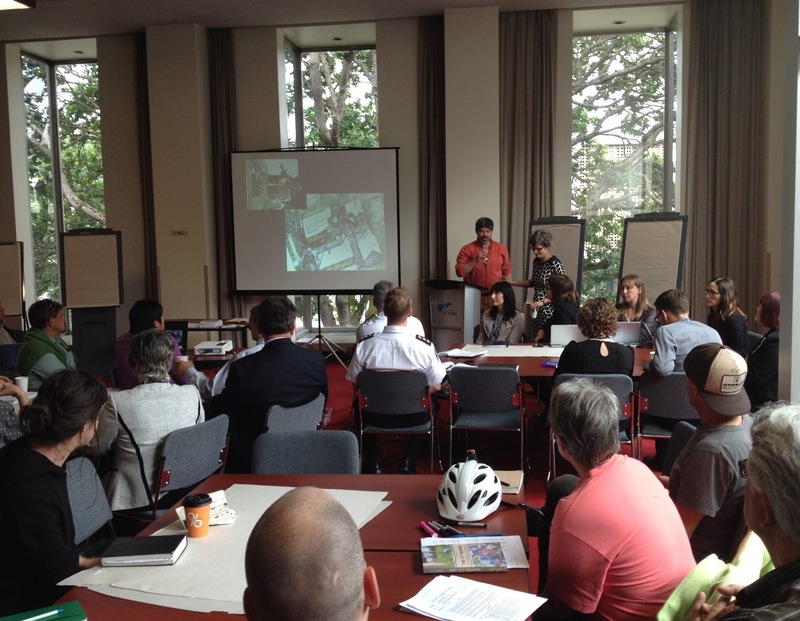 And in Chicago, there's currently a competition underway to design a tiny house village in partnership with the local AIA chapter. 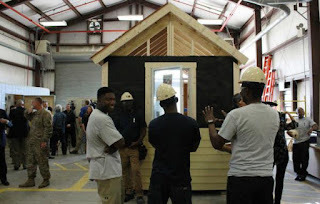 A prototype of the winning design will be constructed and on display at the Tiny Homes Summit in April at the University of Chicago. Dozens of other projects are currently in the works throughout the U.S. and beyond, and I look forward to reporting on more progress next year. Want to get involved? Join the movement! 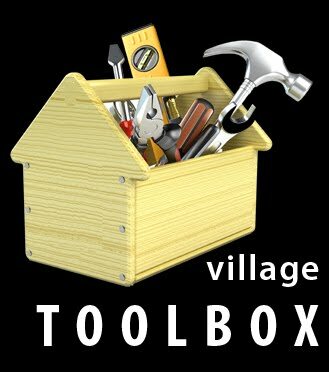 See if there's an existing effort to start a community near you on the Village Collaborative Network, and join the conversation on the Village Collaborative Facebook Page. For more detailed information on this subject pick up a copy of Tent City Urbanism. Awesome. Just Plain awesome work this year, this model is so simple, sensible, and inspirational that it will be replicated again and again in the years to come. Thank you for being pioneers in this effort, it's the one thing I can hold on to when I am feeling a shortage of hope for the future. How do we get something like this started in tulsa oklahoma. We have not that much to help the homeless? You did great work. I am a home improvement contractor by profession that's why I loved your all posts. I am waiting for your 2016 work. Very informative thanks for sharing such an informative information. Great work done. HOME DESIGN is the genuine thing. In the world of internet marketers, there is lots of seem, in addition to unfortunately lots of opportunities that do not measure up. home blog is really a system in which you will find the very best assistance, the training which will supply you with the tools to achieve success, and individuals working together with individuals: leading by example and enjoyable yourself on at the same time. Olympia's Quixote Village just a few days, and Madison's OM Village was still just an idea. 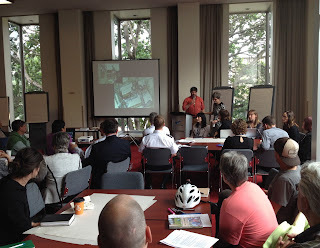 Since then, these projects have helped inspire a housing model being pursued throughout the country. Dr Andrew Unterweger can help you. Have you ever tried improving the looks of your house? Like engaging for a better improvement? Well, if not then maybe this would be a good time to do so.